Votivelight in bisque porcelain with Hummingbirds engraved motif. Gift box included. Dimensions: Height 7.5 cm – Diameter 11.3 cm Burning time: up to 6 hours A lithophane (French: lithophanie) is an etched or molded artwork in very thin translucent porcelain that can only be seen clearly when back lit with a light source. The Bernardaud Votivelight was made with this traditional engraving technique on a fine bisque (non-glazed) porcelain that was invented in Limoges in 1828. Bernardaud still use it to craft beautiful votives that come in a wide variety of decor. The glow of the candle shines through the raised and carved surface of the votive, contrasting light against shadow and thus revealing its richly detailed design. Votivelight in bisque porcelain with Coral reaf engraved motif. Gift box included. Votivelight in bisque porcelain with Paris monuments engraved motif. Gift box included. Dimensions: Height 7.5 cm – Diameter 11.3 cm Burning time: up to 6 hours A lithophane (French: lithophanie) is an etched or molded artwork in very thin translucent porcelain that can only be seen clearly when back lit with a light source. 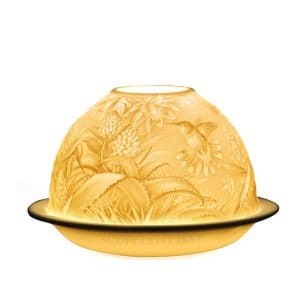 The Bernardaud Votivelight was made with this traditional engraving technique on a fine bisque (non-glazed) porcelain that was invented in Limoges in 1828. Bernardaud still use it to craft beautiful votives that come in a wide variety of decor. The glow of the candle shines through the raised and carved surface of the votive, contrasting light against shadow and thus revealing its richly detailed design. Votivelight in bisque porcelain with Daisies engraved motif. Gift box included. Dimensions: Height 7.5 cm – Diameter 11.3 cm Burning time: up to 6 hours A lithophane (French: lithophanie) is an etched or molded artwork in very thin translucent porcelain that can only be seen clearly when back lit with a light source. The Bernardaud Votivelight was made with this traditional engraving technique on a fine bisque (non-glazed) porcelain that was invented in Limoges in 1828. Bernardaud still use it to craft beautiful votives that come in a wide variety of decor. The glow of the candle shines through the raised and carved surface of the votive, contrasting light against shadow and thus revealing its richly detailed design. Votivelight in bisque porcelain with Sweet peas engraved motif. Gift box included. Dimensions: Height 7.5 cm – Diameter 11.3 cm Burning time: up to 6 hours A lithophane (French: lithophanie) is an etched or molded artwork in very thin translucent porcelain that can only be seen clearly when back lit with a light source. The Bernardaud Votivelight was made with this traditional engraving technique on a fine bisque (non-glazed) porcelain that was invented in Limoges in 1828. Bernardaud still use it to craft beautiful votives that come in a wide variety of decor. The glow of the candle shines through the raised and carved surface of the votive, contrasting light against shadow and thus revealing its richly detailed design. Votivelight in bisque porcelain with Love engraved motif. Gift box included. Dimensions: Height 7.5 cm – Diameter 11.3 cm Burning time: up to 6 hours A lithophane (French: lithophanie) is an etched or molded artwork in very thin translucent porcelain that can only be seen clearly when back lit with a light source. The Bernardaud Votivelight was made with this traditional engraving technique on a fine bisque (non-glazed) porcelain that was invented in Limoges in 1828. Bernardaud still use it to craft beautiful votives that come in a wide variety of decor. The glow of the candle shines through the raised and carved surface of the votive, contrasting light against shadow and thus revealing its richly detailed design. Votivelight in bisque porcelain with Wedding engraved motif. Gift box included. Votivelight in bisque porcelain with Nutcracker engraved motif. Gift box included. Dimensions: Height 7.5 cm – Diameter 11.3 cm Burning time: up to 6 hours A lithophane (French: lithophanie) is an etched or molded artwork in very thin translucent porcelain that can only be seen clearly when back lit with a light source. The Bernardaud Votivelight was made with this traditional engraving technique on a fine bisque (non-glazed) porcelain that was invented in Limoges in 1828. Bernardaud still use it to craft beautiful votives that come in a wide variety of decor. The glow of the candle shines through the raised and carved surface of the votive, contrasting light against shadow and thus revealing its richly detailed design. Votivelight in bisque porcelain with Butterflies in flight engraved motif. Gift box included. Dimensions: Height 7.5 cm – Diameter 11.3 cm Burning time: up to 6 hours A lithophane (French: lithophanie) is an etched or molded artwork in very thin translucent porcelain that can only be seen clearly when back lit with a light source. The Bernardaud Votivelight was made with this traditional engraving technique on a fine bisque (non-glazed) porcelain that was invented in Limoges in 1828. Bernardaud still use it to craft beautiful votives that come in a wide variety of decor. The glow of the candle shines through the raised and carved surface of the votive, contrasting light against shadow and thus revealing its richly detailed design. Votivelight in bisque porcelain with Roses engraved motif. Gift box included. Dimensions: Height 7.5 cm – Diameter 11.3 cm Burning time: up to 6 hours A lithophane (French: lithophanie) is an etched or molded artwork in very thin translucent porcelain that can only be seen clearly when back lit with a light source. The Bernardaud Votivelight was made with this traditional engraving technique on a fine bisque (non-glazed) porcelain that was invented in Limoges in 1828. Bernardaud still use it to craft beautiful votives that come in a wide variety of decor. The glow of the candle shines through the raised and carved surface of the votive, contrasting light against shadow and thus revealing its richly detailed design. Dimensions: Height 7.5 cm – Diameter 11.3 cm Burning time: up to 6 hours A lithophane (French: lithophanie) is an etched or molded artwork in very thin translucent porcelain that can only be seen clearly when back lit with a light source. The Bernardaud Votivelight was made with this traditional engraving technique on a fine bisque (non-glazed) porcelain that was invented in Limoges in 1828. Bernardaud still use it to craft beautiful votives that come in a wide variety of decor. The glow of the candle shines through the raised and carved surface of the votive, contrasting light against shadow and thus revealing its richly detailed design. Votivelight in bisque porcelain with Versailles engraved motif. Gift box included. 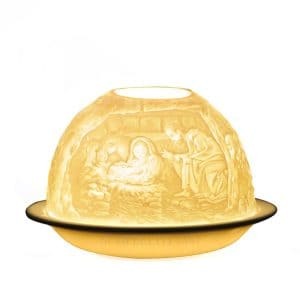 Dimensions: Height 7.5 cm – Diameter 11.3 cm Burning time: up to 6 hours A lithophane (French: lithophanie) is an etched or molded artwork in very thin translucent porcelain that can only be seen clearly when back lit with a light source. The Bernardaud Votivelight was made with this traditional engraving technique on a fine bisque (non-glazed) porcelain that was invented in Limoges in 1828. Bernardaud still use it to craft beautiful votives that come in a wide variety of decor. The glow of the candle shines through the raised and carved surface of the votive, contrasting light against shadow and thus revealing its richly detailed design. Votivelight in bisque porcelain with Lattice engraved motif. Gift box included. Dimensions: Height 7.5 cm – Diameter 11.3 cm Burning time: up to 6 hours A lithophane (French: lithophanie) is an etched or molded artwork in very thin translucent porcelain that can only be seen clearly when back lit with a light source. The Bernardaud Votivelight was made with this traditional engraving technique on a fine bisque (non-glazed) porcelain that was invented in Limoges in 1828. Bernardaud still use it to craft beautiful votives that come in a wide variety of decor. The glow of the candle shines through the raised and carved surface of the votive, contrasting light against shadow and thus revealing its richly detailed design. Votivelight in bisque porcelain with New York by the sea engraved motif. Gift box included. Dimensions: Height 7.5 cm – Diameter 11.3 cm Burning time: up to 6 hours A lithophane (French: lithophanie) is an etched or molded artwork in very thin translucent porcelain that can only be seen clearly when back lit with a light source. The Bernardaud Votivelight was made with this traditional engraving technique on a fine bisque (non-glazed) porcelain that was invented in Limoges in 1828. Bernardaud still use it to craft beautiful votives that come in a wide variety of decor. The glow of the candle shines through the raised and carved surface of the votive, contrasting light against shadow and thus revealing its richly detailed design. Votivelight in bisque porcelain with Scenes of Paris engraved motif. Gift box included. Dimensions: Height 7.5 cm – Diameter 11.3 cm Burning time: up to 6 hours A lithophane (French: lithophanie) is an etched or molded artwork in very thin translucent porcelain that can only be seen clearly when back lit with a light source. The Bernardaud Votivelight was made with this traditional engraving technique on a fine bisque (non-glazed) porcelain that was invented in Limoges in 1828. Bernardaud still use it to craft beautiful votives that come in a wide variety of decor. The glow of the candle shines through the raised and carved surface of the votive, contrasting light against shadow and thus revealing its richly detailed design. Votivelight in bisque porcelain with Venice engraved motif. Gift box included. Dimensions: Height 7.5 cm – Diameter 11.3 cm Burning time: up to 6 hours A lithophane (French: lithophanie) is an etched or molded artwork in very thin translucent porcelain that can only be seen clearly when back lit with a light source. The Bernardaud Votivelight was made with this traditional engraving technique on a fine bisque (non-glazed) porcelain that was invented in Limoges in 1828. Bernardaud still use it to craft beautiful votives that come in a wide variety of decor. The glow of the candle shines through the raised and carved surface of the votive, contrasting light against shadow and thus revealing its richly detailed design. Votivelight in bisque porcelain with Cats engraved motif. Gift box included. Dimensions: Height 7.5 cm – Diameter 11.3 cm Burning time: up to 6 hours A lithophane (French: lithophanie) is an etched or molded artwork in very thin translucent porcelain that can only be seen clearly when back lit with a light source. The Bernardaud Votivelight was made with this traditional engraving technique on a fine bisque (non-glazed) porcelain that was invented in Limoges in 1828. Bernardaud still use it to craft beautiful votives that come in a wide variety of decor. The glow of the candle shines through the raised and carved surface of the votive, contrasting light against shadow and thus revealing its richly detailed design. Votivelight in bisque porcelain with Dance engraved motif. Gift box included. Dimensions: Height 7.5 cm – Diameter 11.3 cm Burning time: up to 6 hours A lithophane (French: lithophanie) is an etched or molded artwork in very thin translucent porcelain that can only be seen clearly when back lit with a light source. The Bernardaud Votivelight was made with this traditional engraving technique on a fine bisque (non-glazed) porcelain that was invented in Limoges in 1828. Bernardaud still use it to craft beautiful votives that come in a wide variety of decor. The glow of the candle shines through the raised and carved surface of the votive, contrasting light against shadow and thus revealing its richly detailed design. Votivelight in bisque porcelain with Angels engraved motif. Gift box included. Dimensions: Height 7.5 cm – Diameter 11.3 cm Burning time: up to 6 hours A lithophane (French: lithophanie) is an etched or molded artwork in very thin translucent porcelain that can only be seen clearly when back lit with a light source. The Bernardaud Votivelight was made with this traditional engraving technique on a fine bisque (non-glazed) porcelain that was invented in Limoges in 1828. Bernardaud still use it to craft beautiful votives that come in a wide variety of decor. The glow of the candle shines through the raised and carved surface of the votive, contrasting light against shadow and thus revealing its richly detailed design. Votivelight in bisque porcelain with Louvre engraved motif. Gift box included. Dimensions: Height 7.5 cm – Diameter 11.3 cm Burning time: up to 6 hours A lithophane (French: lithophanie) is an etched or molded artwork in very thin translucent porcelain that can only be seen clearly when back lit with a light source. The Bernardaud Votivelight was made with this traditional engraving technique on a fine bisque (non-glazed) porcelain that was invented in Limoges in 1828. Bernardaud still use it to craft beautiful votives that come in a wide variety of decor. The glow of the candle shines through the raised and carved surface of the votive, contrasting light against shadow and thus revealing its richly detailed design. Votivelight in bisque porcelain with Sailboats engraved motif. Gift box included. Dimensions: Height 7.5 cm – Diameter 11.3 cm Burning time: up to 6 hours A lithophane (French: lithophanie) is an etched or molded artwork in very thin translucent porcelain that can only be seen clearly when back lit with a light source. The Bernardaud Votivelight was made with this traditional engraving technique on a fine bisque (non-glazed) porcelain that was invented in Limoges in 1828. Bernardaud still use it to craft beautiful votives that come in a wide variety of decor. The glow of the candle shines through the raised and carved surface of the votive, contrasting light against shadow and thus revealing its richly detailed design. Votivelight in bisque porcelain with Christmas tree engraved motif. Gift box included. Dimensions: Height 7.5 cm – Diameter 11.3 cm Burning time: up to 6 hours A lithophane (French: lithophanie) is an etched or molded artwork in very thin translucent porcelain that can only be seen clearly when back lit with a light source. The Bernardaud Votivelight was made with this traditional engraving technique on a fine bisque (non-glazed) porcelain that was invented in Limoges in 1828. Bernardaud still use it to craft beautiful votives that come in a wide variety of decor. The glow of the candle shines through the raised and carved surface of the votive, contrasting light against shadow and thus revealing its richly detailed design. Votivelight in bisque porcelain with Chateaux of the Loire engraved motif. Gift box included. Dimensions: Height 7.5 cm – Diameter 11.3 cm Burning time: up to 6 hours A lithophane (French: lithophanie) is an etched or molded artwork in very thin translucent porcelain that can only be seen clearly when back lit with a light source. The Bernardaud Votivelight was made with this traditional engraving technique on a fine bisque (non-glazed) porcelain that was invented in Limoges in 1828. Bernardaud still use it to craft beautiful votives that come in a wide variety of decor. The glow of the candle shines through the raised and carved surface of the votive, contrasting light against shadow and thus revealing its richly detailed design. Votivelight in bisque porcelain with Dogs engraved motif. Gift box included. Dimensions: Height 7.5 cm – Diameter 11.3 cm Burning time: up to 6 hours A lithophane (French: lithophanie) is an etched or molded artwork in very thin translucent porcelain that can only be seen clearly when back lit with a light source. The Bernardaud Votivelight was made with this traditional engraving technique on a fine bisque (non-glazed) porcelain that was invented in Limoges in 1828. Bernardaud still use it to craft beautiful votives that come in a wide variety of decor. The glow of the candle shines through the raised and carved surface of the votive, contrasting light against shadow and thus revealing its richly detailed design. Votivelight in bisque porcelain with Forest engraved motif. Gift box included. Dimensions: Height 7.5 cm – Diameter 11.3 cm Burning time: up to 6 hours A lithophane (French: lithophanie) is an etched or molded artwork in very thin translucent porcelain that can only be seen clearly when back lit with a light source. The Bernardaud Votivelight was made with this traditional engraving technique on a fine bisque (non-glazed) porcelain that was invented in Limoges in 1828. Bernardaud still use it to craft beautiful votives that come in a wide variety of decor. The glow of the candle shines through the raised and carved surface of the votive, contrasting light against shadow and thus revealing its richly detailed design. Votivelight in bisque porcelain with Magnolia blossoms engraved motif. Gift box included. Dimensions: Height 7.5 cm – Diameter 11.3 cm Burning time: up to 6 hours A lithophane (French: lithophanie) is an etched or molded artwork in very thin translucent porcelain that can only be seen clearly when back lit with a light source. The Bernardaud Votivelight was made with this traditional engraving technique on a fine bisque (non-glazed) porcelain that was invented in Limoges in 1828. Bernardaud still use it to craft beautiful votives that come in a wide variety of decor. The glow of the candle shines through the raised and carved surface of the votive, contrasting light against shadow and thus revealing its richly detailed design. Votivelight in bisque porcelain with Green grapes engraved motif. Gift box included. Dimensions: Height 7.5 cm – Diameter 11.3 cm Burning time: up to 6 hours A lithophane (French: lithophanie) is an etched or molded artwork in very thin translucent porcelain that can only be seen clearly when back lit with a light source. The Bernardaud Votivelight was made with this traditional engraving technique on a fine bisque (non-glazed) porcelain that was invented in Limoges in 1828. Bernardaud still use it to craft beautiful votives that come in a wide variety of decor. The glow of the candle shines through the raised and carved surface of the votive, contrasting light against shadow and thus revealing its richly detailed design. Votivelight in bisque porcelain with Cherry blossoms engraved motif. Gift box included. Dimensions: Height 7.5 cm – Diameter 11.3 cm Burning time: up to 6 hours A lithophane (French: lithophanie) is an etched or molded artwork in very thin translucent porcelain that can only be seen clearly when back lit with a light source. The Bernardaud Votivelight was made with this traditional engraving technique on a fine bisque (non-glazed) porcelain that was invented in Limoges in 1828. Bernardaud still use it to craft beautiful votives that come in a wide variety of decor. The glow of the candle shines through the raised and carved surface of the votive, contrasting light against shadow and thus revealing its richly detailed design. Limoges porcelain is a hard porcelain made since 1771 in various factories in the city of Limoges. In 1767 in Saint-Yrieix-la-Perche, near Limoges, a kaolin field was discovered, a material necessary for the production of hard porcelain. This discovery changed the history of Limoges and made it the capital of French ceramics. The Limoges Commercial Court in 1962 designaited the “Limoges” trademark only for porcelain manufactured and decorated in Limoges. For over 150 years, Bernardaud has been constantly at the forefront of production techniques and decorations of splendid porcelain. A typically French taste that reveals itself through shapes and decorations of the most genuine tradition, flanked by innovative and contemporary porcelain services. Furthermore, the Bernardaud company is famous all over the world for the beauty of its lithophanes.